These are some of my trade “secrets,” including my recipe for cream cheese wedding cake frosting. I hope you find some of them useful! 1. A box mix cake covered in delicious homemade frosting is quicker and easier, and can be just as delicious (or more so) than from-scratch cake. Replace the water and oil with milk and melted butter to give it a richer, more homemade taste. 2. Make your own frosting. It is worth the effort and doesn’t take much time. The flavor is incomparable to canned frosting and even if you use it on an un-enhanced box mix cake, it will still taste from scratch rather than generic. If you’re looking for a good recipe, I have many favorites in my Cake & Frosting Index. 3. For cakes that never stick to the pan, no matter how big it is: grease the bottom of your pan, cover it (bottom only) with parchment paper, then grease and flour the whole thing. I use this mostly for bigger pans, but for 12″ and under, Miracle Pan Release works perfectly without the extra steps. 4. Cool your cake completely before frosting. Otherwise the frosting will melt off and your efforts will have been for naught. Another tip on cooling: after baking, allow your cake to sit in the pan for five minutes and then turn it out onto a cooling rack so that the heat releases easier and it cools faster. Otherwise the cake continues to bake in the pan after it’s out of the oven and dries it out more. Leaving it in the pan 5 minutes allows it to set a little and reduces the risk of the cake breaking since it’s hot from the oven. 5. If your cake feels dry to the touch (this happens especially around the edges), use a spray bottle to douse the affected area with water. I use a bottle designated for water only b/c you don’t want to get residue from a bottle that previously housed cleaner on something you’re going to eat. This trick works wonderfully and doesn’t affect the taste at all. Don’t be afraid to put too much water—just squirt until it feels moist and then keep it covered or wrapped until you’re ready to frost it. The cake will absorb the moisture uniformly so that it’s moist and delicate throughout. You can also add liqueur to the spray bottle to add a subtle flavor to the cake. I used chocolate liqueur on a red velvet wedding cake and have also used Kahlua on a chocolate cake and both worked very well. 6. Here’s another water bottle trick that is invaluable to me. To make your frosting super-smooth on your cake, use your water bottle to douse the entire cake after you’ve smoothed it out as much as you can. Your spatula will glide over it easily to give a flawless finish and whatever water remains on the surface will evaporate and no one will be the wiser. Oh, and you can’t do this without an offset spatula or some sort of long, straight edged tool. 7. Here’s another secret that you have to either go to the cake store for or buy online. You know that flavor that’s in the white frosting of every wedding cake you’ve ever had? Have you ever tried to duplicate it? You can’t find it in any Betty Crocker frosting and you will probably never be able to make it at home without crème bouquet. It is a divine flavor emulsion that gives that sweet wedding cake taste to your frosting. You can add it to plain vanilla frosting, but I also add it to my cream cheese frosting for a subtle, wonderful effect. So there was the wedding cake taste underlying the rich, tangy cream cheese flavor. Yum! Beat the butter and cream cheese until smooth. Add the remaining ingredients and beat on medium/high. Use immediately or store at room temp until cake is frosted. Refrigerate or freeze if you won’t be using it within a few days. Use the water bottle trick to get it smooth on your cake. *Crème bouquet is a flavoring, essential to achieving the “wedding cake” flavor. 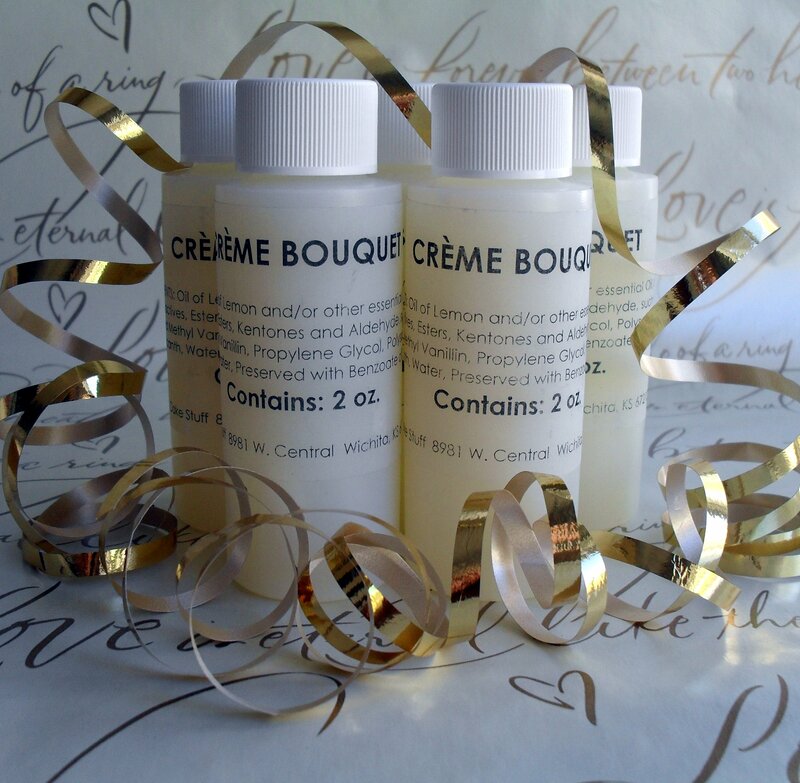 To find out more about crème bouquet, click here. 9. And if you do make cakes enough, you should probably invest in a cake leveler. Unless you’re uniquely gifted, it’s nearly impossible to cut the cake top off in a straight line. Wilton sells two different sizes of cake levelers (I prefer the large and use it for all my cakes) that makes this a breeze. You just adjust it to the height you want and saw across the cake (keeping the cutter straight up and down) and you’ll have a perfectly flat cake that will stack gorgeously. 10. If you won’t be frosting the cake as soon as it’s cool, wrap it well with plastic wrap or seal it in Ziploc bag and press the air out (without squashing the cake). If it dries out in the slightest, just give it a spray with water or liqueur to restore moisture. You can also freeze your cake (after wrapping it well) and when ready to assemble, take it out of the freezer and frost it while frozen! It actually makes the job easier since the hard cakes are easier to handle and cold cake firms up the frosting as it is applied, which helps when icing a cake. I hope these tips help you a little with your own cake baking. Please share your own tips in the comments! 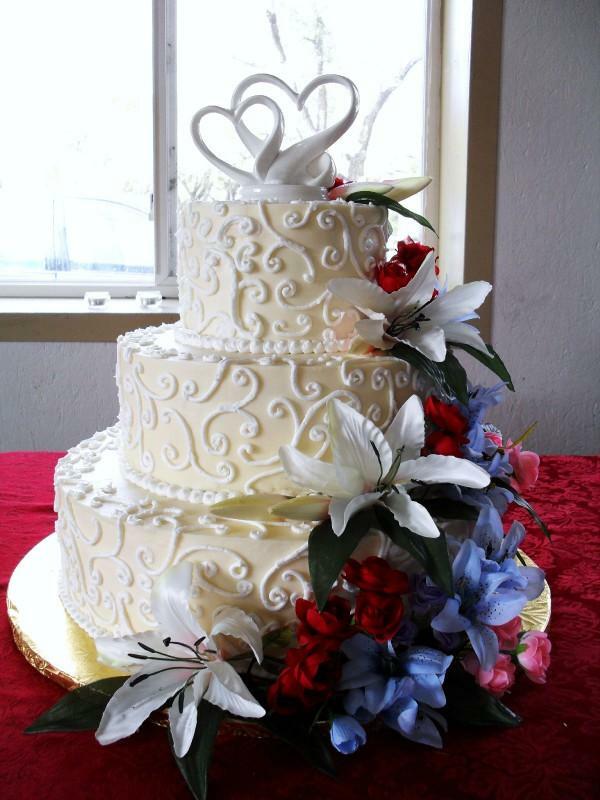 Posted in Cake & Frosting, My Favorites, Tips & Tricks and tagged cream cheese wedding frosting cake making tips tricks. Bookmark the permalink. I veronica. Would this be a good frosting to use if making an Italian Crème and Red Velvet wedding cake?